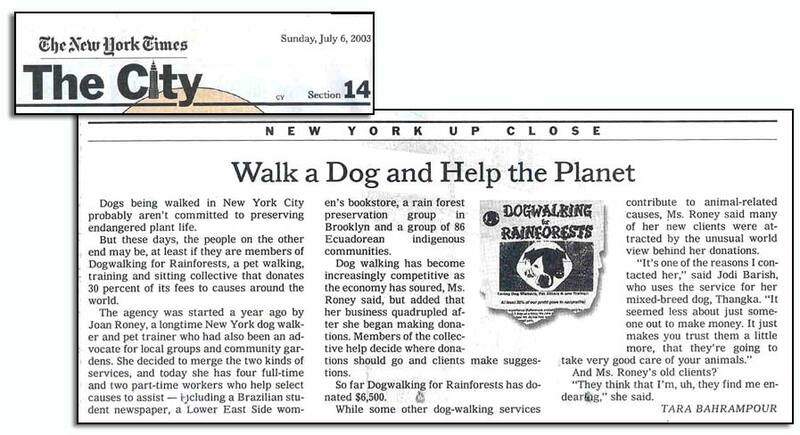 Dog Walking for Rainforests was founded with the belief that we could use our love for caring for dogs and cats to help New York City and the rest of the world. By hiring Dog Walking for Rainforests NYC, you help support all of these charities and projects. Animal Aware (Guatemala) operates an animal sanctuary, organizes traveling spay/neuter clinics as well as community veterinary and education services all in Guatemala. We have donated over $1700. In addition we have sent volunteers to work for a month at the animal sanctuary. Beehive Collective (Maine) a grassroots, design collective that inspires & promotes action by making collaborative, noncopyrighted, intricate & beautiful images. Breakfree Project (Brooklyn, NY) The Break Free Project founded by one of our walkers, Mavi Graves, is a musical tour that hit the road across the US in a vehicle fueled by waste vegetable oil in summer 2007. Bread & Puppet Theater (Glover, Vermont) is one of the oldest, nonprofit, self-supporting theatre companies in the U.S. Touring the U.S., Europe, Latin America, Asia, they address social, political, and environmental issues inviting the communities to participate as actors in their pageants. 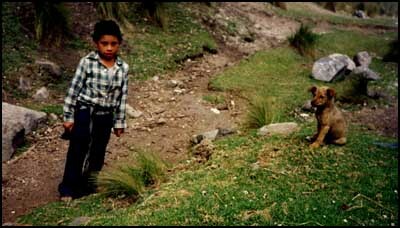 Cispes has been dedicated to supporting the Salvadorean people's struggle for justice since 1980 when the US government became involved in a 12-year civil war where hundreds of thousands of people became displaced and 80,000 people were mysteriously executed. Fierce (NYC) is a community organization for Transgender, Lesbian, Gay, Bisexual, Two Spirit, Queer, and Questioning (TLGBTSQQ) youth of color. Makarik Nihua’s Legal Defense Fund (Amazon Rainforests, Ecuador) – Via Judith Kimerling, author of Amazon Crude, our collective has donated over $3000 to assist 30 indigeonous communities from Ecuador’s Amazon in a lawsuit to force Chevron Texaco to finally clean up ChevronTexaco’s oil spill in the rainforest and its rivers (FYI- the spill was one and half times that of the Exxon Valdez oil spill off the coast of Alaska). Mexicanos Unidos is a non-profit serving the Mexican/Latin@ immigrant community of New York City. The group uses art and cultural education to inform on HIV/AIDS, cancer, immigrant rights, and homophobia. More Gardens! (Bronx, NY) is a group of community gardeners and environmental and social justice activists committed to revitalizing and enhancing NYC’s existing community gardens and making more gardens! NYC Chapter of the National Lawyer’s Guild Through its members of lawyers & law students the Guild works locally, nationally and internationally as an effective political and social force in the service of people who couldn't otherwise afford it. New York Environmental Law Project (NYC) is a public interest organization which counsels & represents groups and individuals concerned with the preservation & improvement of community environmental conditions. NY S.A.V.E, Inc., is a non-profit organization dedicated to the aid and assistance of low-income pet owners residing in New York City whose pet is in need of emergency veterinary care. Le Petit Versailles, (Alphabet City, NYC) created in 1996 as a GreenThumb garden, LPV is a project of Allied Productions, a non profit artist-run organization. As well as providing a green oasis, LPV is dedicated to fostering community in the arts, through performances, screenings, workshops. Picture the Homeless is a NYC grass roots NGO led by the homeless to ensure the participation of homeless people in the public policy decisions affecting their lives. Rainforest Relief In Fall 2005 Dogwalking for Rainforests Collective/Petsitters for Nonprofits co-produced two public service announcements that appeared on NY1. In one of the ads Jane Goodall, friend of the Chimpanzee & the U.N.'s Messanger of Peace, speaks directly to NYers. RR's mission is to halt U.S. consumption of resources that come from Temperate and Tropical Rainforests areas such as aluminum, gold, oil, wood and beef. RainforestsofNewYork.org A campaign of New York Climate Action Group, Rainforest Relief, and other New York City rainforest advocates looking to end New York City's use of products from Old Growth & Tropical Rainforests. DFR Collective helped fund part (alongside a DFR client) of the new website design & implementation. Reverend Billy & the Church of Life After Shoppinguses theater, humor, and grassroots organizing to advance individuals and communities towards a more equitable future. Sea Shepherd protects marine wildlife worldwide through direct action on the high seas. One of their big campaigns is to shut down the annual killing of baby harp seals known as whitecoats. Seeds of Peace provides for a safe meeting space between Israeli and Palestinian children and teenagers on a cultural exchange visit across borders. Social Tees Animal Rescue(NYC) is a small T-shirt company that rescues, rehabs, and places animals. We've donated money for the rescue and placement of a paralyzed iguana, several kittens, a chameleon, and dogs. Students For A Free Tibet works in solidarity with the Tibetan people in their struggle for freedom and independence from China. Time’s Up (NYC) is an entirely volunteer non-profit that promotes non-polluting transportation & sustainable energy sources. Cyclists & skaters will especially enjoy participating in their festive auto-free events such as the Central Park Moonlight Ride. Tropical Forest Group catalyzes policy, science and advocacy to conserve and restore the planet’s remaining tropical forests. Victory Gardens Project (Athens, Maine) is a farm bridging the gaps between urban and rural communities. During the summers inner city youth are invited to learn about organic farming & the produce is distributed in Urban areas. Write: VGP, RFD 1, Box 6025, Athens, ME 04912. Viralatas Feliz In spring/summer 2003 DFR spayed, neutered and medically treated several street dogs in Rio de Janiero. Viralatas means to turn over the cans and thus has come to mean stray dog in Brazilian Portuguese. Wildlife Protection Society of India (WPSI) combats poaching and the escalating wildlife trade, particularly in wild tigers of which there are only 1500 left in India. Bluestockings Bookstore & Activist Resource Center (Lower East Side, NYC)- DFR Collective helped to ensure the strength of their Gay/Lesbian/Transgender section during the bookstore’s transition in 2003 from a Women’s Bookstore into a Bookstore/Activist Resource Center. Build It Green! NYC NYC's only nonprofit retail outlet for salvaged & surplus building materials. Can't Afford Em Buttons (Bronx) An income-sharing community (founded by one of our walkers, Angie Spitzer) that promotes peace & justice by making t-shirts, buttons, underwear, patches. (They silkscreened the DFR collective t-shirts you've seen our walkers wear.) They also publish & produce both written word & music. E-Consultant free utilities & software ideas for your computer. Stop buying & start sharing. GreenBiz.com is the lead online resource helping companies align environmental responsiblity with business success. GreenerPrinter Referred by several of our clients this topnotch, high-quality/affordable printing company is devoted to environmentally friendly business practices. Greg Barber Company Specialists in environmental paper & printing. They print our business cards. Habana Outpost (Brooklyn) Awesome example of a hip cuban restaurant that promotes eco-education & sustainablity in its architecture & energy use. If Green (Portland) builds contemporary furniture & custom cabinetry from sustainable products. A non-for-profit animal shelter system that rescues, cares for and finds homes for homeless and abandoned animals in all five boros. Unfortunately they euthanize pets when they can't find them homes which is why we ask you to please consider adopting from them. OrganicBouquet.com is your premier online source for socially and environmentally responsible gifts such as freshly picked organic flowers, organic fruits, gourmet organic gift baskets, and handcrafted vases from around the world. Rock Dove Collectivecoordinates for the uninsured or minimally insured a network of health practitioners who provide physical, mental, sexual, emotional, social and spiritual care from a (radical/progressive) perspective on well-being. Urban Organic is a NYC home delivery service of Organic produce & groceries.